This right-hand drive BJ46 comes straight from Japan! 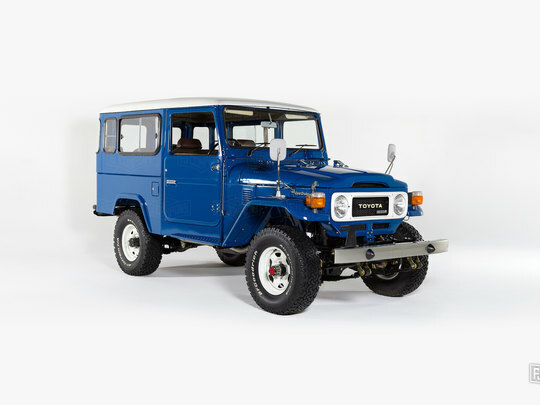 This right-hand drive restoration marks an important milestone for The FJ Company. Its Australian owner bought it in Japan and shipped it to us so that we could leave it like new, making it our very first Contract Restoration. Since the owner’s history with this Land Cruiser is so incredible, we asked him to send us a brief account so we could share it with all of you. My uncle was a Park Ranger with SANPWS, the South Australian National Parks & Wildlife Service, (see badge below) and drovean SANPWS-issuedgrey FJ40 in the late Seventies. Much like in this Australian ad, a classic. I always thought it was a great vehicle, but as I got older, I realized it was iconic. When I began hunting for a 4x4 to use on my visits back home to South Australia, I knew I needed a classic 40 series Land Cruiser. The car had to be a right-hand driver for Australia, and I wanted a late model medium wheelbase to accommodate the family and gear. So I began searching for a Japanese domestic market BJ44 or BJ46. I found this site very helpful in determining that the BJ46 was the ideal model for what I needed. Introduced at the end of 1982, it came equipped with a strong 3.4-liter 3B engine, 5-speed transmission, full-floating axles, power steering and factory A/C. Due to these extras, the BJ46 is one of the most evolved versions of the Land Cruiser. I finally tracked down this matching-numbers car in beautiful Medium Blue from a used car dealer in Gunma Prefecture in central Japan. Although it took some work to get it to The FJ Company from Yokohama Port, but the finished product was the effort!